Meet Kalpana Debbarma. Kalpana coaches kids football in India. "I have always been interested in football," she says. "In school when I started playing the coaches noticed me and encouraged me to play and go further. "I was determined to pursue it. My family also encouraged me to play and that is why I continued, first as a player in my school and then as part of the state team." Kalpana decided to build on her love for the game by helping children in her village in the state of Tripura, in the north east of India, as a coach. "We do face challenges in our village, we do not have too many facilities in terms of grounds, markers or infrastructure," she says. "However, the young people in the village love to play football." To aid her in her goal of helping the local kids, Kalpana was invited to take part in a Premier Skills course in Guwahati, where 60 community coaches learned how to deliver and develop coaching sessions for their local community. "I didn't know what to expect," she says of the Premier League course, delivered in partnership with the British Council, the Sports Authority of India and the All India Football Federation. "I was also a little worried because I am not very fluent in any other language than Bengali." 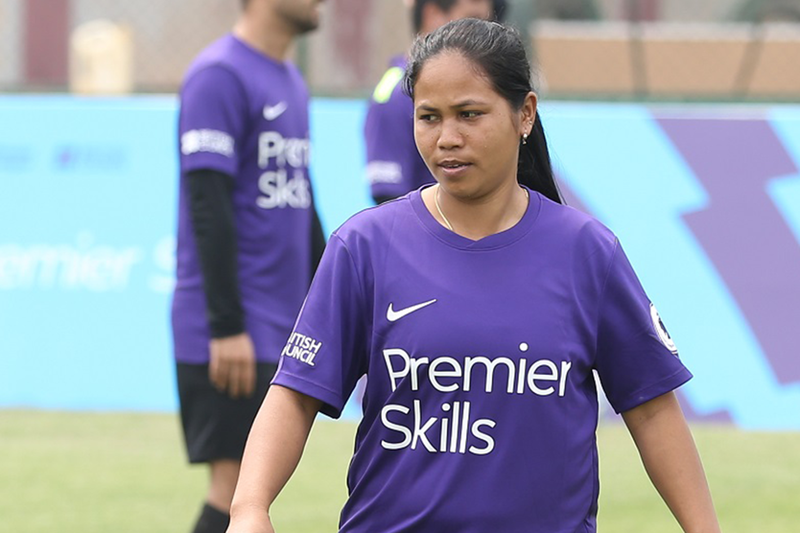 But thanks to the Premier Skills instructors, which included coaches from Tottenham Hotspur and Manchester City, Kalpana overcame the language barrier and went back to her village a much-improved coach. "It was a life-changing experience for me," she says. "I have learnt a lot and want to make sure that what I learnt can be shared with others." Kalpana believes Premier Skills will have a significant impact on her village. "The course has helped me learn how to work with the different age groups I teach," she says. "I now know how to make sure that everyone is included, young or old. "It has given me the confidence to teach in the community and will improve my coaching."